Making the move to Morrisville, PA? Get ready for fun! 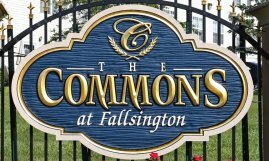 Don't miss these fantastic shops and attractions just minutes from your apartment or townhome at The Commons at Fallsington. The Trenton Thunder are the double-A affiliate of the New York Yankees. Head across the river to see them at Arm & Hammer Park; the seats are cheap, the views are great and you'll get a first look at the legends of tomorrow. Located at 833 West Trenton Avenue, this is where Morrisville buys its groceries. Everything you need is here! Pennsylvania's official state theatre, the Bucks County Playhouse in New Hope produces from July-September, returning in December for holiday shows. Many famous careers and Broadway productions have been launched here. The best part about moving to Morrisville, PA is that you're so close to the action -- the pleasures of Bucks County are right around the corner, and there are plenty of transportation links to Trenton, Philadelphia and New York. Enjoy your new home!